So it’s Girl Scout cookie booth time. Which means I am spending large amounts of my time standing outside our local Publix. Now, this is our third year doing this, so I have already seen and written about the generous people and the mean people, and the weird and perverted people. I have also written about how crazy some of the troops get with their cookie sales. You would think that there would be nothing left to write about. But you would be thinking wrong. Because I saw the craziest thing. On our first day there I went into the store and waited at customer service so that I could introduce myself to the manager. In line ahead of me was one lady holding two bags and an employee wanting to buy something. The lady very nicely insisted that the employee go ahead since he had limited break time. I was surprised by her kindness to the employee, especially since while being nice to the employee she was screaming insults to an older gentleman who accidentally brushed up against her as he tried to pass by with his cart. When it was her turn to be helped she handed over her two bags of food. The employee immediately began to return all the items, and the lady chatted away merrily with her. I thought it was a little peculiar but didn’t pay too much attention. But I have done 7 more cookie booths since then. And this lady has shown up at every single one of them, carrying bags of food into the store. So finally yesterday I asked one of the employees what her deal was. And the employee told me that the lady comes EVERY. SINGLE. DAY to return the food she purchased the day before. All of which she has opened and eaten one days food out of. Let me rephrase this to make sure you understand. This lady buys food every day, eats one meals worth of it, then returns her leftovers to get her money back. EVERY. SINGLE. DAY. I asked the employee a few times, in a few different ways, if this was really what was happening. She kept telling me yes. I asked if she was ever told that she couldn’t return items. The employee told me every now and then she is told no but not often. And I verified that she is really as cheerful and happy with the employees as she seemed, and had no shame or remorse about what she was doing. She has no shame or remorse. For essentially stealing food every day. I can’t even fathom doing that. I have never returned anything, even when I should. Like the times when you buy fruit and get home and see that all the fruit on the inside of the container is gross. I just eat the good fruit and find another way to use the bad fruit. Like currently I am stuck with way too many bananas and they have turned black and are starting to get gross. But I would never return them. So instead I made a batch of this banana bread and two batches of Double Chocolate Banana Muffins. 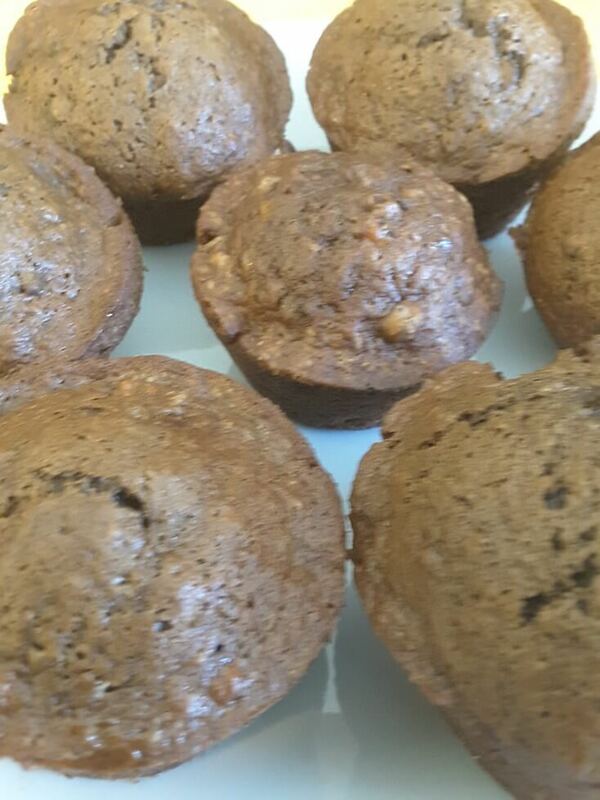 They are delicious, which is really a given with a chocolate muffin AND chocolate chips. Yeah for chocolate chips! Combine all dry ingredients (flour through baking powder) in a bowl and combine. Add bananas, oil and egg to bowl. Blend well. It will seem too dry at first, but as the banana combines with they dry ingredients it will incorporate all ingredients. Scoop batter into greased muffin tins, making 3/4 full.